Why York? York helps students accelerate their careers with experiential education, internships, field study, practicum and research experiences. 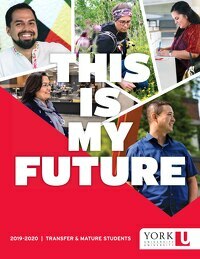 York University is committed to promoting student mobility and accessibility to education and welcomes transfer students from recognized and accredited institutions (including some private institutions). If you have completed postsecondary courses elsewhere, you may be eligible to receive credit which will reduce the length of your degree. Most programs at York consist of 120 credits and take four years to complete. Provided the courses you have taken fit your program, you may receive up to a maximum of 90 credits. The amount of transfer credit you receive depends on whether the courses you have taken are transferable (equivalent to York courses), how many courses you have taken, grades achieved, course content and whether all the courses you have taken fit in the program to which you are applying. Institutionally prepared course outlines or syllabi are required when US applicants have taken business, biology, chemistry, economics, mathematics, statistics or physics that may apply to their admitted degree program. The outlines should include a detailed list of topics covered, list of textbooks and number of lecture, tutorial and laboratory hours. Institutionally prepared course outlines or syllabi are required for students who studied outside North America. The outlines should include: detailed list of topics covered, list of textbooks used, grading practices, number of weeks in attendance (excluding examination period), and number of lecture, tutorial and laboratory hours. Computer Science or Information Technology courses must be taken within the last 5 years to be considered for major, minor or pre-requisites credit towards a degree program. When courses are taken longer than 5 years ago, the transfer credit may be used only as elective credit. Strict regulations set out by the Canadian Engineering Accreditation Board (CEAB) limit the amount of transfer credit granted for Engineering degree programs. Courses in engineering science and engineering design content must be completed at a degree-granting Canadian Institution accredited by CEAB. The maximum number of credits granted is 30. Some programs require a course grade of ‘C’ or higher for the course to apply towards a major/minor or to satisfy a prerequisite. The Bachelor of Commerce (BCom) courses are recognized towards certification in a number of professional programs, but not all professional accredited courses completed at other post-secondary institutions are eligible for a course credit exclusion towards a major, minor or pre-requisite credits in a degree program. Courses not granted a course credit exclusion may be used as elective credits. Please review the information about admission and application procedures for international students, which include more details about potential transfer credit. As soon as you are offered admission to York, the Office of Admissions will begin assessing your previous postsecondary studies for transfer credit eligibility. Wait times for transfer assessment completion vary depending on the time of year. The earlier you accept your offer, the earlier you will receive your transfer credit statement. how your previous postsecondary studies fit with the program you’ve been admitted to at York. To complete the credit assessment, students must provide Official Transcript(s) either by uploading a copy through MyFile or by having a copy mailed directly to the Office of Admissions. After the credit assessment is complete, the Office of Admissions thoroughly reviews previous course(s) for content overlap with your existing program's degree requirements. When significant overlap between courses is identified, the studies are granted course credit exclusion(s) and/or course waiver status. Identified courses do not need to be retaken at York and they reduce your remaining degree requirements. In order to facilitate course review, students are required to submit course outline(s) for assessment of academic content, rigor and materials covered. Course descriptions/syllabi/course outlines must represent the timeframe you took the course. Copies of detailed courses outlines/syllabi are the preferred choice. These can be uploaded via MyFile, faxed or mailed directly from your former school. Here is an example of an acceptable course outline for submission. This assessment outlines the amount of transfer credit from your prior studies applicable to the academic program at York University to which you have been admitted. All assessments are conditional upon receipt of a final official transcript for each previous postsecondary institution you have attended. If you are in the process of finishing your studies and have not yet been issued a final transcript, you may submit your official final transcript upon completion of your previous studies. Grades achieved in postsecondary course(s) accepted by York University for transfer credit will not affect your academic average at York. If you repeat course exclusions granted from previous studies, it will result in a reduction of your transfer credit. Printable transfer credit statements are made available on MyFile in time for enrolment. Current students can access their transfer credit statement via the Office of the Registrar. You may request a re-evaluation. Note that credit re-evaluation will only occur if/when new information that was not available at the time of your initial assessment is required. New information may include a detailed course description, updated transcript(s) or a change in your academic program at York University. In accordance with Eligibility for Transfer Credit guidelines outlined in the York University Calendar (please select year of admission), you have one academic term from the date of admission or re-admission to York University to submit documentation (including detailed course outlines) for re-evaluation of transfer credit. Check the status of your application to find out if your transfer credit assessment is complete. If you have successfully finished the transfer credit assessment and have met all eligibility requirements, you will receive an offer of admission to York. Once you accept your offer, book an academic advising appointment to begin the enrolment process. If you have completed or are currently waiting the credit and course assessment, we encourage students to join Transfer Connect - a community just for transfer students and a place where you can ask questions about your transfer to York in a group chat or one-on-one chat. You can also find out more information about specialized resources offered to York transfer students. Transfer Connect is available to students admitted to the University for whom we have begun the transfer credit assessment process. You'll receive a personalized email invitation to join the online community. If you require further information about the transfer process, please use Ask an Admissions Expert.